Understanding the psychological and growth stages children and dogs go through can help you better prepare for how they will interact. 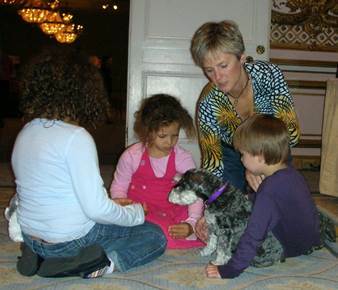 The Pooch Coach is the Official Dog Trainer for Babies ‘R Us, where she lectures on safely introducing children & dogs. 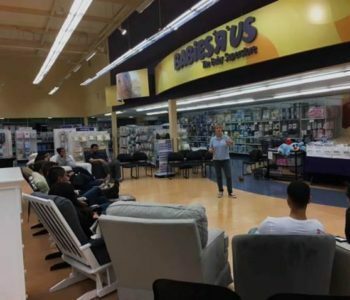 She has also lead several workshops on this topic. My first and most important note is that all dogs are animals who, without proper socialization and training, can be a danger to your child but, with proper training and socialization, can be one of the greatest joys in your child’s life. Infants want to grab things, toddlers are curious, older kids like to tease. We’re all familiar with clichés about child behavior. Parents with a new puppy or dog in the family can benefit from a more detailed understanding, however, of the developmental variables that affect how kids and dogs relate to each other. Considering how your child and dog will interact in different situations will help to ensure safety as well as a happy bond between the two through the years. Puppyhood (up to 1.5 years): A puppy, just like a child, tests a variety of behaviors while learning how to interact within his social group – his human family. Puppies learn a lot about the world, and about getting along with others through “object play” that involves their teeth and paws. Dogs use their mouths and teeth in situations where humans would use their hands. A puppy who doesn’t have its “mouthiness” redirected to appropriate chew toys may unintentionally hurt a child. Social Maturity*: At social maturity, dogs fine tune their social skills with other dogs and with humans. When a dog reaches maturity, he often exhibits a different temperament than he did as a puppy. The dog may become either more shy or more assertive, for example. A child’s behavior that previously didn’t bother the dog – such as pushing the dog down, wrestling him, or taking a ball from his mouth- might bother him now. Also, if a dog was not socialized to children while he was a puppy, he may show fear or fear aggression towards them at first. It is important to socialize puppies early on, and it is also important to carefully monitor the temperament and reaction of a new older (6 months +) dog to an infant or child. Old age: Older dogs are likely to be affected by physical conditions such as arthritis, diminished eyesight and hearing, and slower responses. They might be less able to tolerate physical play. If a problem becomes evident at any point, it’s important to discuss this right away with your veterinarian or a dog behavior specialist. Make sure your dog has a physical to rule out any problems you should be aware of. Newborn to 6 months: Your dog might have trouble adjusting to the new smells, sounds and disruptions of the normal routine that go along with having a new infant in the house. As the baby’s motor skills become more accomplished, she may reach and randomly grab and hold some fur, an ear or a mouth. Parents should always monitor an infant closely. A dog who seems anxious in this situation might need extra attention and assistance in getting accustomed to the new baby. Never leave a baby and a dog alone unsupervised. 6 to 24 months: When children begin to be mobile, such as crawling, a whole new introduction is needed. The dog will be surprised and possibly scared at first. Children learning to walk are unsteady and can accidentally be knocked down by an excited dog -or even his tail. A toddler who is intently focused on getting somewhere can steamroller right over a dog who is in the way. The family dog might be the object of a toddler’s curiosity and may be mouthed on, squeezed or patted too hard. Also, a toddler’s budding desire for independence is often accompanied by tantrums, noise, and commotion that can produce chaos in the household. It’s important that your dog is able to escape this hubbub when necessary by retreating to a relatively quiet, safe place. 2 to 5 years: This time is the peak of imagination and “pretend” and the family dog may be recruited to join a tea party or to play the part of a trusty steed. A dogs toys may be taken hostage, his food may be played with or hidden, and his sleep may be suddenly or stealthily interrupted. Again, parents should always monitor the situation and be sensitive to any signs of anxiety or fear on the dog’s part. This is a good time to start teaching your child the proper and safe ways to interact with your pet. And, still do not leave the child and dog alone unsupervised. 5 to 9 years: During these years, kids continue to be extremely curious and imaginative, while receiving much less adult supervision. Play with friends become more organized, and the kids may walk (or drag) the dog around the house on an improvised leash. Even a child who loves the dog might unthinkingly punish him verbally or physically for a perceived crime, such a knocking down the wall of a “fort”. Kids this age want dogs to react to them, and they may tease the dog in a high pitched voice or dangling a toy. Parents should be on the alert to immediately putting an end to any teasing or improper treatment of the dog. 9 to 12 years: By the time they reach this age group, kids have a well-developed capacity to consider how others feel. They may be able to take on more responsibility in caring for a dog, such as feeding, grooming, and exercising him. It’s a great time to teach your child more about fun training techniques and about canine sports such as obedience and agility. With some children, it also time to watch out for purposefully rough play or teasing. It’s critically important to always be aware of how your child and dog are interacting. With young children, supervision is a must. Don’t overestimate your child’s ability to anticipate or understand how certain actions might disturb, frighten, hurt or even enrage the dog. Since children don’t automatically recognize or understand dog body language and vocalization, they often don’t know when to stop their interactions. Instill in your child a sense of compassion. Set some basic rules: no teasing, no rough games, and no approaching strange dogs without an adult present. Under your guidance, your child and the family dog will enjoy a lasting bond. Although an older child may be included in dog care, remember that that your dog depends on you for his well being. Children on their own cannot be expected to have the judgment and skills necessary to consistently give a dog the care, exercise and training he needs. Having your child join you in training classes and sessions is a great way to oversee his interactions and teach him proper handling techniques. He should thoroughly understand what is safe and polite to do with a dog and what is not. Always remember that dogs are animals and will naturally behave like animals – which is not always the way humans deem as acceptable behavior. Dogs cannot be expected to behave perfectly (by human definition) in all situations, but they will be very likely to behave in the ways they are carefully and repeatedly taught to behave. Without proper training and treatment of your pet, he could end up snapping at or biting your child – or your child’s friend – when feeling threatened. Make sure you work with your trainer to properly introduce your dog to all the different situations he will encounter as your child grows. This will help ensure a proper and safe reaction from the dog. Both your child and your dog need to learn proper etiquette for dealing with each other. It is your job to work with both of them individually and together so that they learn how to peacefully and lovingly coexist. Most of my best memories from childhood include my dog. I hope you are able to provide your child with the same kind of wonderful memories, while instilling in them love and respect for this incredible species. to ensure your child and dog are safe together.